The Twin Advanced ROM System for the Sega Saturn is a game-specific ROM cartridge peripheral which fits into the Saturn's cartridge slot. They should not be confused with Saturn Backup Memory cartridges or Extended RAM Cartridges which deal with types of RAM (random access memory) - ROM Cartridges deal with game data (read only memory) in a similar manner to the cartridges of older Sega consoles (i.e. the SG-1000, Sega Master System and Sega Mega Drive). ROM Cartridges exist presumably to reduce loading times, a common problem in the early days of disc-based media. The Saturn can read data more quickly from the cartridge slot than from a compact disc, and so it can make more sense to store data in a cartridge instead. However, there is not enough space in a typical ROM cartridge to fit an entire Saturn game inside (complete with CD quality audio, full motion video, etc.) so this space was typically reserved for small amounts of data that is used frequently. The disc would still be used, and so in order to run the game, both a disc and a cartridge would need to be inserted into the console. This was considered a fairly impractical method of playing games (and a cost factor was added due to the more expensive nature of producing cartridges) and so wasn't widely adopted by developers. 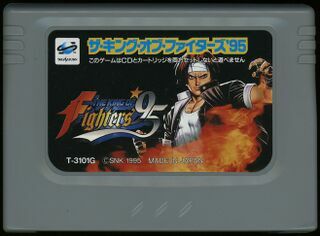 In fact, only The King of Fighters '95 (plus re-releases) and Ultraman: Hikari no Kyojin Densetsu make use of this feature, likely due to the fact that they both pre-date the Extended RAM Cartridge which could achieve similar results in a different way. A filled cartridge slot means that both games can only save data to the Saturn's internal memory, which is both limited in size and is likely to be deleted if the internal battery dies. If the user attempts to run either game without its ROM Cartridge, it will not boot. Likewise these cartridges are not interchangable - you cannot boot Ultraman with The King of Fighters '95's cart and vice versa. It also means these two games can only run on unmodded systems which share the same region encoding - for other games, region locking can be bypassed through an Action Replay device, but this requires the use of the cartridge slot. This type of peripheral was never seen in North America, however surprisingly did make it to PAL regions as The King of Fighters '95 was released there. Curiously no Extended RAM Cartridges were released in that region, making this game the only PAL region game to require use of the cartridge slot. Main article: Twin Advanced ROM System/Magazine articles.